I love rainy afternoons where you have to stay in and do creative stuff! 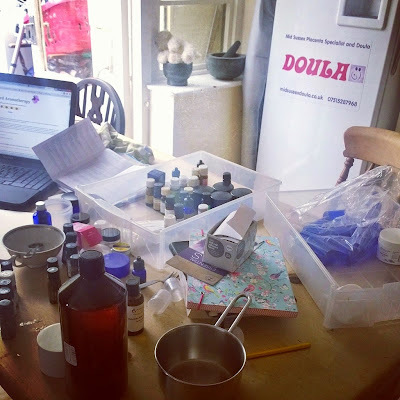 I've had an extensive essential oil collection since my children were small, and I would use aromatherapy instead of conventional medicine for the usual childhood and family ailments. I have a very sensitive and keen sense of smell, and perfume is my weakness. I find some of the oils profoundly comforting and evocative...some I can pinpoint where that comes from, but others are just mysteriously alluring for no particular reason. Lavender reminds me of my mum, who had lavender bags in drawers, and grew lavender by her front step. As a little girl I would play right by these bushes, and the smell reminds me of a very fundamental part of my being, a simple and comforting memory. Vetiver is my absolute favourite oil, deep and complex, a very distinctive smell. I'm blending some oils for a local reflexologist, and to sell on my market stall. This afternoon I finished up by making my very first balm, for my daughter. It has sedative, hypnotic oils to help her sleep, and is a solid perfume balm made with beeswax and shea butter. It's solidifying in the fridge right now, and I had better clear up and get on with dinner!